It's official! 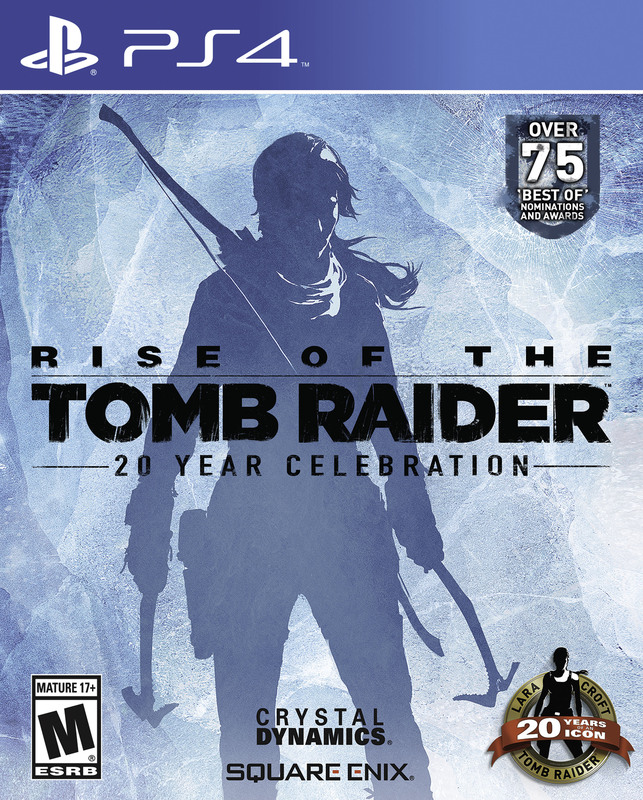 This morning Crystal Dynamics announced that Rise of the Tomb Raider: 20 Year Celebration will launch on PlayStation 4 October 11. This special edition will include the main game, all previously released DLC, plus a new story chapter called "Blood Ties," set in Croft Manor. Other new features include co-op play for Endurance Mode and PlayStation VR support. A collector's edition will also feature a 28-page book filled with official concept art and community contributions. 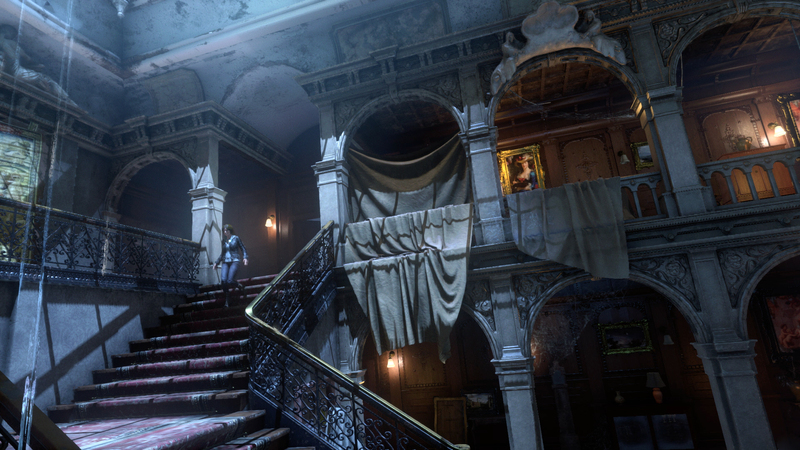 The new single-player Croft Manor DLC chapter, "Blood Ties," will allow players to explore Croft Manor in the main story mode, then defend it against a zombie invasion in a replayable Expedition mode called "Lara’s Nightmare." Blood Ties includes approximately 60 minutes of new gameplay. "Endurance Mode," a DLC pack previously released for Xbox and PC, will include a new online co-op expansion. Nadia (the NPC from the earlier Baba Yaga and Cold Darkness Awakened DLC, will be the second playable character. 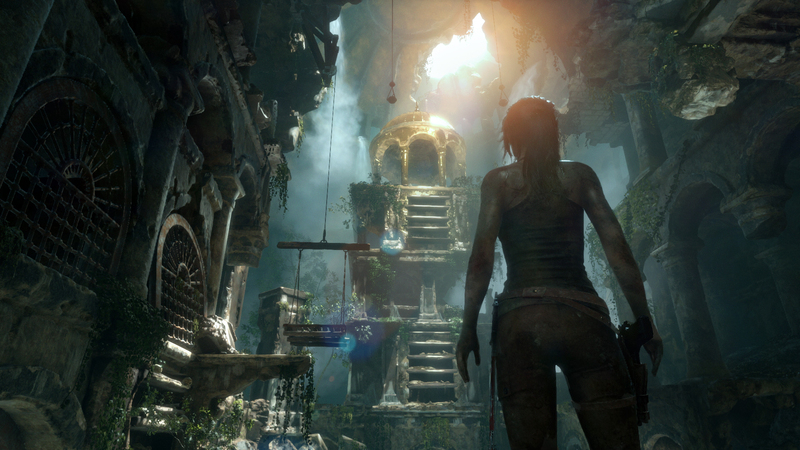 However, through clever design and dialogue, each player will appear as Lara, collaborating with Nadia for survival. Brutal new "Extreme Survivor" difficulty mode with no checkpoints. Re-designed cold-weather outfit inspired by the Antarctica levels in Tomb Raider III, plus classic Tomb Raider Uzis. All existing DLC including "Baba Yaga: The Temple of the Witch" and "Cold Darkness Awakened" packs, 12 outfits, 7 weapons, 35 Expedition Cards, etc., will be included at no extra cost. Support for PlayStation VR that challenges players to unlock the mysteries of Croft Manor in first person. PS4 Twitch integration featuring custom frame and viewer voting. The Artbook Edition will be available worldwide on PlayStation 4 through participating retailers (TBA). Select European retailers will also offer the Artbook Edition for PC. 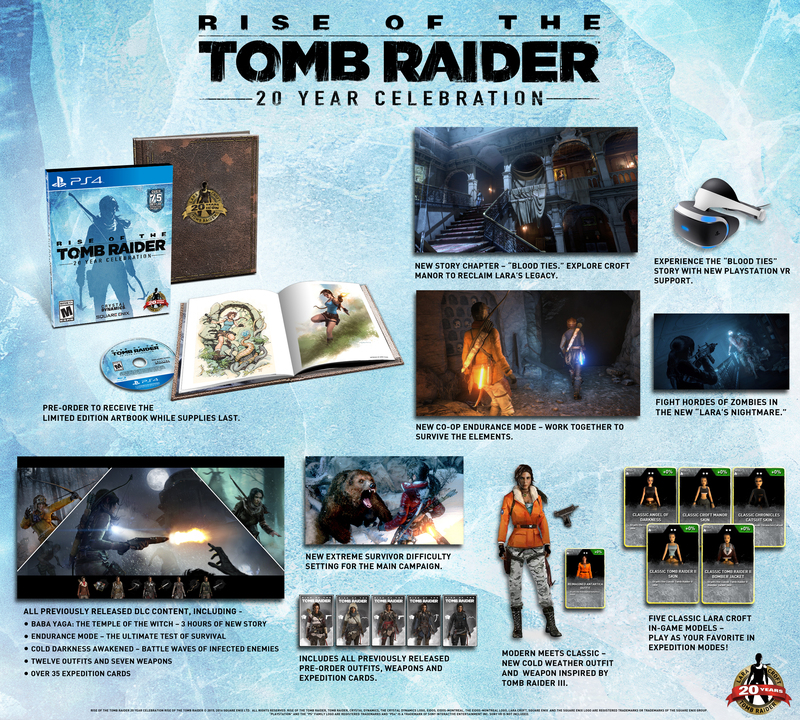 Rise of the Tomb Raider 20th Anniversary Edition (with all the DLC mentioned above) will also be available for PC and Xbox One, though not for Xbox 360. If you already own the original ROTTR game, the Blood Ties DLC and co-op Endurance Mode will be available for PC and Xbox One either separately or as part of the Season Pass. This new DLC is not available for Xbox 360. If you do not own the Season Pass and wish to purchase only the "Blood Ties" pack it will be available separately for $9.99. 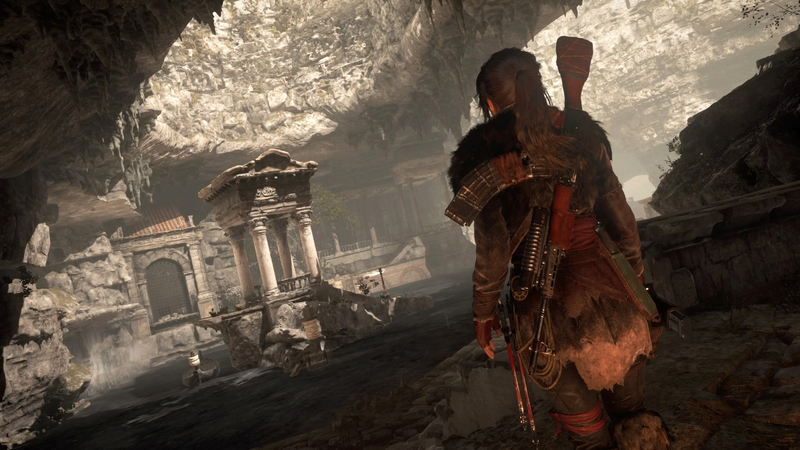 Rise of the Tomb Raider: 20 Year Celebration includes tons of new content. Click to enlarge. Pre-order the PS4 edition through your local game store or Amazon.com I will add links for Amazon UK, the Artbook edition, and the PC/Xbox One editions as soon as I have them. 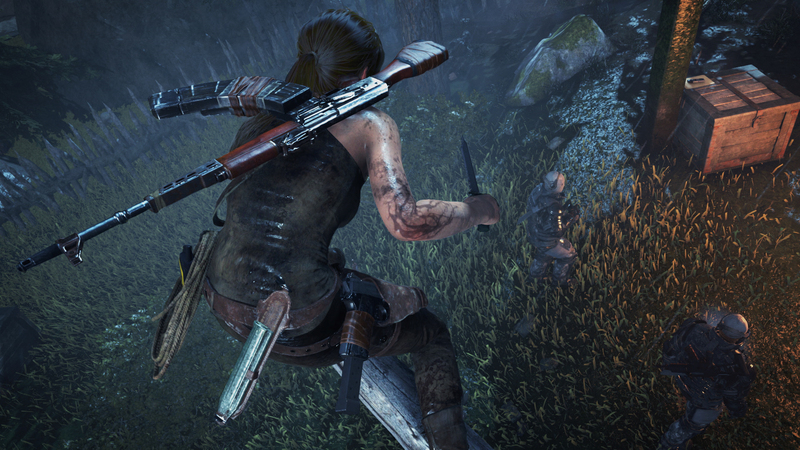 For all the juicy details, check out this post on the official Tomb Raider blog and this Rise of the Tomb Raider: 20 Year Celebration FAQ from Senior Community Manager Meagan Marie. 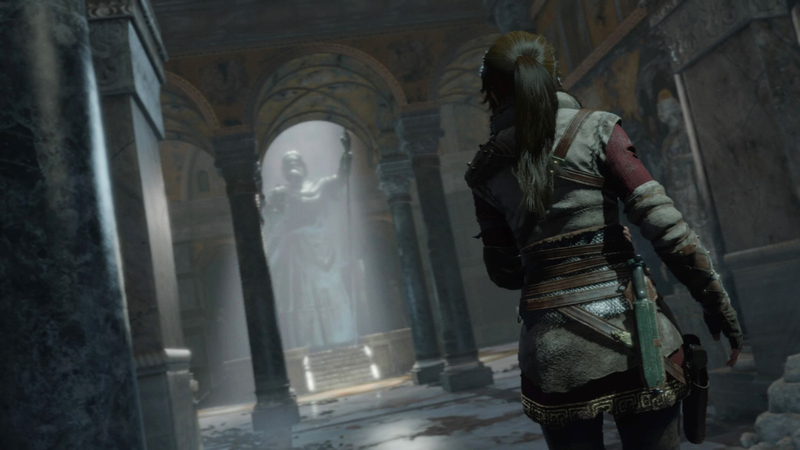 Rise of the Tomb Raider: 20 Year Celebration screenshot. Click to enlarge. Again those that can't afford the One and have the 360 get screwed. You spend $60 and you can't get the DLC. Even if you have the game on the 360 then bought a ONE you still have to spend another $60 to get the croft manor. BUMMER. Buy a PS4 then, like I have. I have preordered ROTTR for PS4 and cant wait to play it. I am really glad Crystal Dynamics included all DLC to date. A lot of PlayStation owners have waited patiently to play this game. Thank goodness we have Stella's guidance in case we get stuck. I wonder if there is included game help in ROTTR like there was in Underworld ? If you cant afford the lastest consoles perhaps auction sites may offer some good discounted refurbished Ones or PS4s that come with warranties or game bundles. Personally I think it best to save up and buy a new one. Anonymous, I certainly understand your complaint. It's tough owning a perfectly good last-gen console after the next-gen version comes out. The Xbox 360 version of Rise is solid, but it's definitely missing features in the next-gen version. It also stinks to have paid for the season pass and not get all the content others are getting. Robin, it's great that you're able to get a new console, and I'm sure a lot of Xbox 360 and PS3 players wish they could too, but not everyone can afford it. Same with PC upgrades. It's the inevitable cycle of gaming, but it's still a challenge for people without much disposable income. Buying used or refurbished is definitely an option, and the prices will eventually come down as new models (like the Xbox One S) come out. Stella's Tomb Raider blog is an unofficial fan site associated with Stella's Tomb Raider Site. Blog contents copyright © Stellalune. Social media icons by Rogie King. Tomb Raider, Lara Croft, Lara Croft and the Guardian of Light, Crystal Dynamics and Eidos are trademarks of Square Enix Holdings Co., Ltd. All rights reserved.